Our SPRING FLING is this Saturday the 16th at Round the Bend Steakhouse in Ashland. Check our Spring Fling tab for all the info! Our April meeting is Wednesday the 20th at the Aksarben Aquarium. John Winkler of the Papio NRD will be our speaker for the evening. He'll be filling us in about the new reservoirs being constructed east of Prairie Queen. We'll have some great raffle prizes as usual! Doors open at 6:30pm and the meeting starts at 7:00. 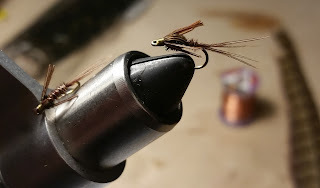 The fly of the month is the classic Pheasant Tail nymph. Check out our Fly of the Month tab for some info about the pattern and spin up your best rendition! Also this month, CFF will have its first FISH-IN at Fremont Lakes on Saturday April 23rd. Click here for directions. We'll be fishing at lakes 1 and 2 with a great pavilion for a pot luck lunch (feel free to bring something to share). Look for our Cornhusker Fly Fishers sign after 10am. Bluegill and bass have already been hitting poppers at these lakes this spring, so if the weather is nice we should have some great top-water action!